Dr. William VanVynck has been practicing as a physical therapist and athletic trainer on Long Island for the over 13 years. 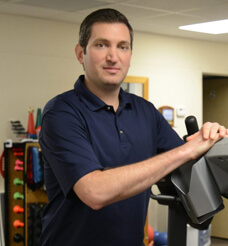 After obtaining an athletic training degree from Sacred Heart University in 2003, he pursued his desire to become a physical therapist and continued his education at Sacred Heart, receiving in Master’s Degree in 2006. Recognizing the importance of higher education and professional recognition, William furthered his education, and obtained his Doctorate of Physical Therapy from the College of Saint Scholastica. William has dedicated his career to focusing on sports injury and orthopedic rehabilitation, having experience working with patients of all levels. He was the the Associate Team Physical Therapist for Farmingdale State College and LIU Post from 2014-2016 and served as the head athletic trainer for the Plainedge School District for over ten years.